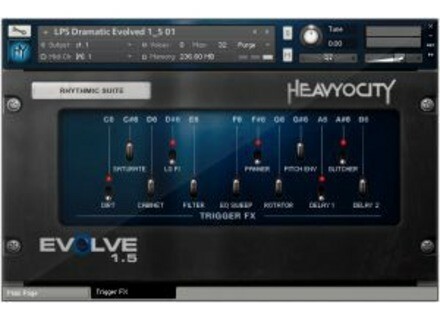 Evolve, Other Virtual Synth from Heavyocity. Product replaced by the Native Instruments Evolve. Heavyocity Media has announced the release of Evolve, a new virtual instrument geared toward film and game audio, as well as artist production and live performance. 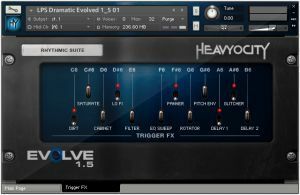 EvolveCreated by the TV and video game composers from Heavy Melody Music & Sound Design, Evolve is a virtual instrument powered by Native Instruments' Kontakt 2 Player. With an emphasis on the dramatic, it is geared toward film and game audio, as well as artist production and live performance. According to Heavyocity , sonically, Evolve doesn't just contain the typical sounds that form the foundation of most composers' setups. Instead, it accentuates them with a powerful combination of diverse percussion, massive stings/transitions and evocative tonalities in ways that have "never been heard before". 600+ beat-sliced loops strategically key-mapped into 7 genre-specific suites. 60 sequenced and arpeggiated percussive and tonal instruments. 75+ modern percussion kits and instruments. 45+ sting and transitional instruments. 250+ tonal instruments and FX. Nearly 6 gigabytes containing 3,900+ 24/16 bit samples. With an MSRP of $399 Evolve is available for Windows and Mac OS X in AU, VST, RTAS, DXi and Standalone formats via the included Kontakt 2 Player. QuikQuak Crowd Chamber QuikQuak has released Crowd Chamber - an audio plug-in that layers multiple variations of a signal to create a crowd simulation.